Who thought Dominoes could help us understand Wills & Trusts? Remember when we were kids? Dominoes was one of my favorite games. Families could play this together. Kids could play it without the parents around. It is an enduring game that is still popular today. And can help us understand why we need Wills, Powers of Attorney and other legal documents. You can use Dominoes to help your clients understand estate planning. Dominoes parallels estate and financial planning in many ways. This is the RETIREMENT & ESTATE PLANNING DOMINO THEORY which you can use. 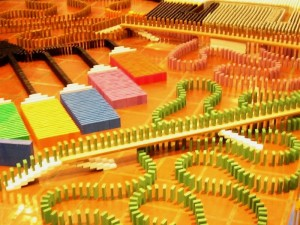 If you complete Estate Planning it is like those amazingly long strings of Dominoes that people set up. More important for you to know is this. Usually when that last Domino falls, it will not be where you expected it would land. Worse than that, it is not where you want it to fall. People usually DO NOT want the results that come from NOT setting up the Dominoes how they would rather they fall. We will talk about key areas of planning that need attention in later posts.